Some foods just go together. Grilled cheese and tomato soup, creamed butter and sugar, garlic and caramelized onions… for me, I'm addicted to raspberry and lemon. So when I saw these bars last year, I knew I had to make them. A little less than a year later and I finally made the recipe. Tangy, vibrant, subtly sweet with a rich, buttery crust. These raspberry lemonade bars are the perfect summer dessert. They're a little bit more dense than your typical lemon bar which makes them even more baker friendly! Easy to cut and they have a GORGEOUS vibrant color. Dust them with powdered sugar if you want but I actually like them better without. Also, DO NOT BAKE THESE IN A METAL DISH. Metal and citrus don't' mix well… it gives it a weird metallic-y flavor, no good. Looking for something to make on The 4th of July? These are the perfect backyard party treat to bring! See my improv suggestions below to make it even more patriotic for the 4th! Cream the butter and sugar together with an electric mixer, then add in vanilla. Add flour until just incorporated. Dump dough in baking pan and press with your hands until it evenly covers the bottom of the dish. Bake for 20 - 25 minutes until slightly golden brown. If you, like me didn't have enough time for the raspberries to thaw on their own, place in microwave for 1 minute to soften them up. Then put in a fine mesh sieve and press the berries through (this removes the seeds) into a large bowl. If you don't mind seeds, you can add them in whole. Or if you don't have a sieve, you can blend them up in a food processor or blender. Add sugar, egg whites, egg, lemon juice + zest, flour, and salt to the bowl and stir to combine. Pour the mixture into the crust (don't worry, it's a very loose mixture, it will thicken) and bake for 25 - 30 minutes depending on your oven and the sized baking dish you use. Let cool to room temperature and then place in the refrigerator for 4 hours (or until they've cooled completely). You can place them in the freezer if you need them sooner but refrigerator is best. If you let them cool overnight, they're even better! These look so good and I can't wait to make them (along with the other combinations you listed)! thanks angie :) i couldn't agree more! oh My!! this is a treat I am looking forward to make.. thanks for the recipe. do you have to store them in the refrigerator as well or can you leave them at room temperature? Thanks, cant wait to try them! yes, make sure you store them in the refrigerator! they'll be fine for a few hours at a party but they're best right out of the refrigerator! has any tried with a graham cracker crust? you could definitely try making them with a grahm cracker crust. i'm sure that would be fantastic. i'm not a huge fan of grahm crackers so i'm always looking for crust alternatives. i bet the panko coconut crust i did for my key lime pie would be delicious too! if you make it with a different crust, let me know how it turns out! great idea! Hello! I made this recipe earlier this week, only instead of using just one type of berry, I mixed raspberries, blueberries, and blackberries. It came out a lovely purple color and tasted great. I did use an 8x8 pan, and it took considerably longer than the listed time here to cook all the way through, close to an hour. I think next time, I'll try it in a 9x13, because I tend to prefer my bars to be thinner. I made these last week the day I went into labor. I was craving lemon and raspberry flavored food and drink the whole last month! A week later, and post baby, they actually taste better, if possible. I think these are best a couple days old (although I didn't really get to eat them right away since we were at the hospital!). Thanks for the recipe!!!!! im so glad you liked them emi! congrats on your new addition - SO EXCITING!!! i agree, the bars are fantastic days later. it's such a forgiving recipe! Just made these with a few changes - strawberries instead of raspberries, quinoa flour, earth balance. 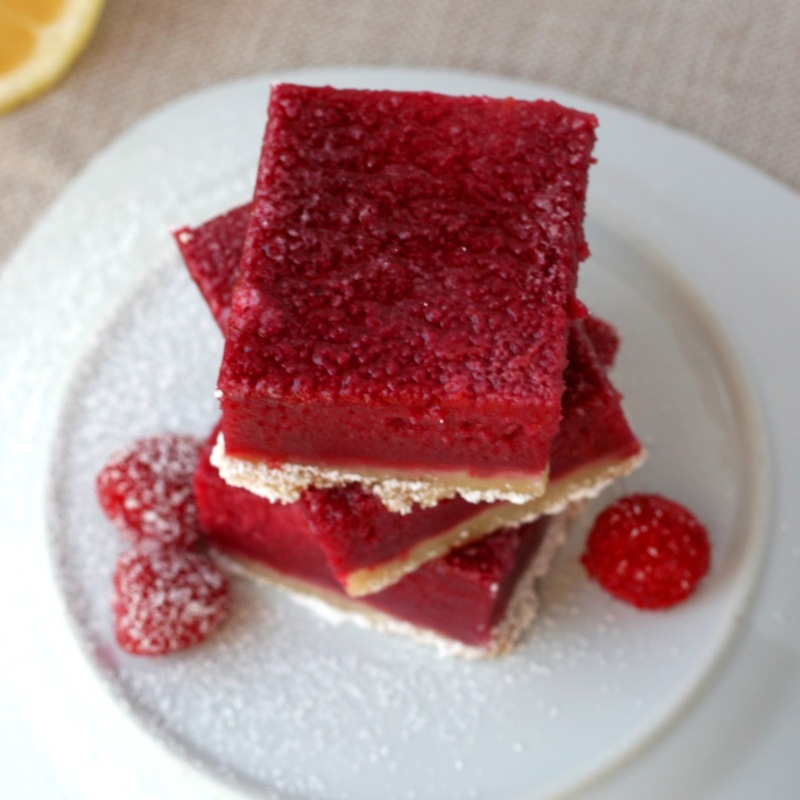 My strawberry lemonade bars are beautiful, delicious, dairy free, soy free, and gluten free. Yum! Thanks for the jumping off point. so great! thanks for sharing your improv's! I found this post though Pinterest. The photo was so beautiful that I just had to come here to read the recipe! And I am so glad I stopped by - love your site! I'm making these right now, the cook time suggested for final cook was a bit short (I think) for my oven, though as the middle is still jiggly. I'm hoping that means it's not cooked through and not the way it's supposed to be? Being that there's no explanation of what it should look like when done, I'm assuming that, since there are eggs in the mix, one would want it to not jiggle when cooked through...They smell heavenly! Can't wait to serve them tomorrow :) Thank you for the post...I've shared via Pinterest. every oven is different. i just made these at my future in-laws and it took 20 more minutes than at my house. it all depends on your oven and the size/type of dish you use. you'll want it to giggle slightly (think a little stiffer than jello). but if it wobbles like crazy, you know you still have some cook time left. thanks for sharing the love on pintrest and thanks for stopping by! Just have to say, I made these yesterday for my brothers and they are absolutely amazing! I will definitely be making these again. And I love how easy they were! Made these today for the 4th, they were great. Thank you! I did make these for the 4th. Mine turned out a little more pinkish than red - not sure why...they were very tasty. I may have added more raspberries than needed, as I went with fresh raspberries and were concerned I didn't have enough after I tossed out the seeds. I also had to bake for closer to 40 minutes. pink sounds pretty! i'm not sure why either, probably just the color of the raspberries. baking time totally varies depending on the size of the dish/type and on the oven. I made these today but didn't have any lemons. What I did have was pink lemonade so I substituted and added less sugar. They are baking right now. I'll let you know how they turn out! Thanks!!! WOW! that is some awesome improv thinking :) do share with us how they turned out! Ahhh Appears to be awesome and tasty, well i don't have skill to give things a try, but i'll think about this one..! woop woop! love your improv and so happy it got you a 2nd place!!! thanks for sharing! Saw these on pinterest and was HOOKED!! I'm making them tomorrow! That color is fabulous, and I have a bag of raspberries just waiting to be used! I love all the variation idea too, have to try grapefruit next. PS- I LOVE your photography! Hmm could I use fresh raspberries instead of frozen? I'm making these right now, strawberry lemon, and for the crust i added 1/2 tsp ground ginger and 1/4 tsp ground nutmeg. It smells amazing in the oven. I completely forgot to update, but the bars were a massive hit. The guest of honor devoured them and demanded the recipe. These look so yummy. Im a huge fan of a berry and citrus combo. I think I'm going to try these and let it set up overnight and then add another fruit on top and let it sit again to setup. Have you tried this? almost like a trifle bar?? Makes me dream about the warm days of summer... Happy new year by the way! these bars are just beautiful! I came across them on pinterest! I have now made them five ways from Sunday! I like to blend the fruit then press through fine sieve. I had a lot of summer fruit that I prepped and froze myself and it worked fabulously. however, my fave one I made was classic raspberry with a decoction of lemon balm. I have some lemon balm in a pot and just did 1 cup mashed leaves and 1 cup boiling water til it turned nice and pale yellow, about 10 mins. I topped the bars with lemon zest. they were awesome! Thanks so much for a beautiful recipe for anytime of the year!! I love how versatile it is! This recipe looks incredible and I am really looking forward to trying to recreate the magic :) What is your opinion on substitution in this recipe if I cannot use butter, would you suggest substituting shortening or margarine? 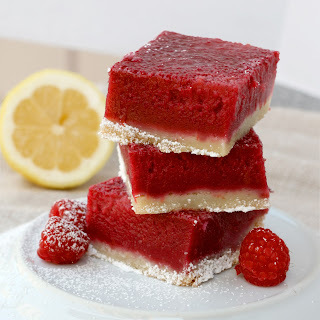 I LOVE lemon + raspberry! I look forward to making these this spring! I will try to do them and I think that instead of raspberries I'll use passion fruit (frozen). Maybe even both. sounds AMAZING - send me some?! let me know how it turns out! thanks for the idea. thanks desiree - so glad you guys liked them! Made these with a cake mix crust. Delicious! that's a great improv idea - thanks for sharing! I think I will try these this week. Do you drain the raspberries before passing through the sieve or keep the juice? yes, definitely keep the juice! that's just raspberry flavor/goodness! I made these last night (so they would sit in the fridge overnight to chill), and there was a lot of oil run-off in the bottom of the pan. The dough was entirely too wet and was more butter than anything. I looked up the original recipe, and it looks as though you've cut down on a cup of flour in the crust. The filling taste DELICIOUS though, almost like a raspberry cheesecake but no dairy (which is fabulous because I've a friend who can't eat dairy). Oh no! I'm so sorry to hear that the crust didn't turn out for you. It's very strange because I've never had a problem with them. I double checked and the measurements on the crust recipe are actually identical to the recipe posted here. Maybe something got flopped around when you were baking them?! Love the idea of a biscuit base but you might want to keep the components separate. A biscuit would most likely be too absorbant of a dough to hold up as a bar. Although I'm sure it would make an interesting crumble type of bar! If you try it, please let me know how it turns out! These look wonderful, but would they keep 2 weeks in the freezer? I've never frozen them Elizabeth but I'd be very curious how they hold up. If you do, please let me know! have some in the oven right now, hope they turn out as good as yours! Hello I have a question when you put 9T for the butter does the T stand for tablespoon? Hi Oscar, sorry it took me so long to write you back. Yes, 9T = tablespoon. Hope they turned out great! Have you ever put these in the freezer to eat later on? I haven't but if you do, let me know how they work! Looks too delicious ...can i use pineapple ...or banana ..? T. is Tablespoons and t. is teaspoons. I have just found your post here for these amazing bars. I hope to be making them this week. All this time later, which combo do you feel is your personal favorite? I wanna try the raspberry lemonade combo, but think I would like to try another as well. raspberry lemonade are definitely my favorite as i'm quite the sucker for that combo. i also really enjoy doing a lemon + thyme infused combination - it's a little adventurous for some but i love combining herbs into desserts. hope you love them as much as me! I tried making these because they looked really good, but the filling was really soupy even after hours of cooling!! I just did a version of these bars on my blog also. Very nice and perfectly tart! I'm glad you liked them! Cheers and happy new year Story. I've read through all the comments but did not notice anyone else ask this question. Do you beat the egg whites first before adding them to the other ingredients? Can you explain how they are incorporated in more detail please? Nope, no need to beat the egg whites first. Sorry for the delayed response. Hope this helps! 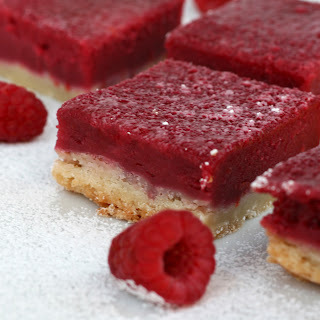 Can you make this in a larger pan and just double the crust so the raspberry layer is thinner? You definitely can. It will probably affect baking time. Keep am eye on it early. It should set but not turn brown or darken on the edges. This recipe on lemon raspberry bars looks incredible. Can't wait to try. I have made these to be on the dessert table for a party of 200 people on Saturday. I have another party in 10 days and would love to make a couple of more batches and freeze them so I done in the kitchen for awhile. Did anyone ever answer the question about being able to freeze these? Love the way they look and taste! Awesome recipe. Very easy as well. I also made the blackberry lime and grapefruit variations. I used Ruby Red grapefruit and think that may not have been the best choice because the tartness was missing. I'm gonna try again with normal pink grapefruit and see what happens. I've been using your recipe for a couple years, and I always get compliments on these bars! I want to try a strawberry orange bar, how much sugar would you recommend? You just made my night Jessica! I'm so glad you love the recipe! I would try 1/2 c. Because orange is way less sweet than lemon. You could also try doing 1/3 lemon juice to 2/3 orange juice ratio just to help with the tartness. Strawberry orange sound so good! You have to let me know how it turns out! Can I make this ahead of time. And freeze it? I've never frozen them so I can't speak from experience. You can make these bars 2 days in advance and just keep them in the refrigerator. If you need to do it further in advance, let me know how the freezing turns out. Many have asked but I've never gotten an answer on that question. A creation based on a typo = a happy accident. On June 8,2012, a reader asked about substituting a graham cracker crust. Part of your response refers to a recipe for "panko coconut crust" you created for your Key Lime pie. It hadn't occurred to me to use a sweet nut crust with a tart filling. Without macadamias, but too eager to wait, I substituted 1 packed cup of sweetened coconut for the nuts, reduced the sugar to 1/2 cup and followed the recipe from there. A hand-mixer did all the work. The result is lightly sweet, subtly tart, and fresh. It will be a pleasure to tweak and try different ways, but I thought you should know how this happy result developed from a typo!! Keep improvising!! Thanks for sharing Kathy, I love hearing how people change the recipes! Sometimes kitchen mistakes end up being the best discoveries. Glad your happy accident worked out! The result is lightly sweet, subtly tart, and fresh.